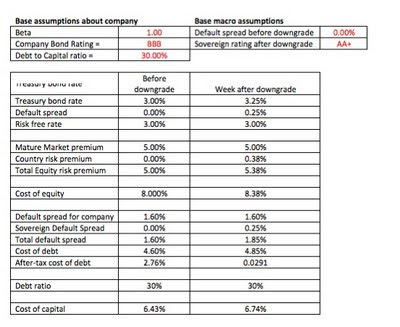 A Sovereign Ratings Downgrade for the US? End of the world or bump in the road? It is a sign of the times that a blog such as mine, dedicated to micro questions (on corporate finance and valuation), is bogged down on the macro question of sovereign default and its consequences. But there is no getting around the fact that corporations and investors will spend the next week focused on the circus in Washington DC and not on their core businesses. So, let's ask the key questions: What is it that investors fear will happen next week? And what if those fears become reality? The US will not default next week or in the near future, even if there is no debt ceiling legislation passed by August 2. However, the damage has already have been done. The perception that an entity will not default is built not only on the resources controlled by the entity but on the faith that it will always find a way to use these resources to pay its bondholders. Once investors begin debating whether a borrower will default, the faith has been shaken and like Humpty Dumpty, it cannot be put together again. Bottom line: Investors now perceive the US government as being capable of defaulting on their debt. That will not change, no matter what happens over the next week. 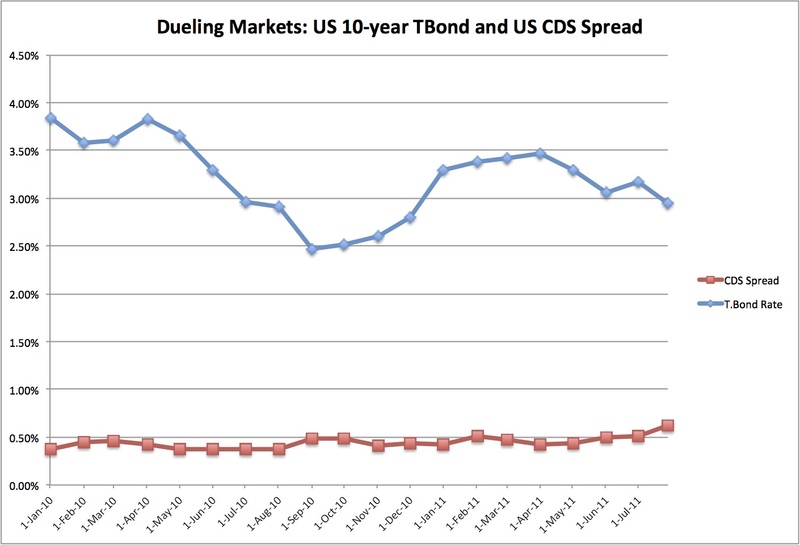 There does seem to be a disconnect between the two markets, with the T.Bond rate decreasing as the default spread in the CDS market rises; you would expect the two to move together. There are a couple of interpretations. The first is that these markets attract different investors, with the nervous nellies (and default risk speculators) going into the CDS market and the oblivious rest holding treasury bonds. 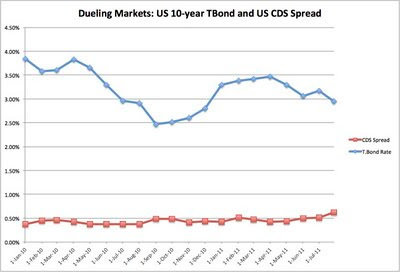 The second (and more likely explanation) is that there is information in both markets: the CDS market, for all its faults, is signaling that the default risk in the US Treasury has risen (by about 0.25% over the year) and the the treasury bond market is indicating slower economic growth (and thus lower real interest rates) in the future. Bottom line: The market has already downgraded the implicit sovereign rating for the United States. 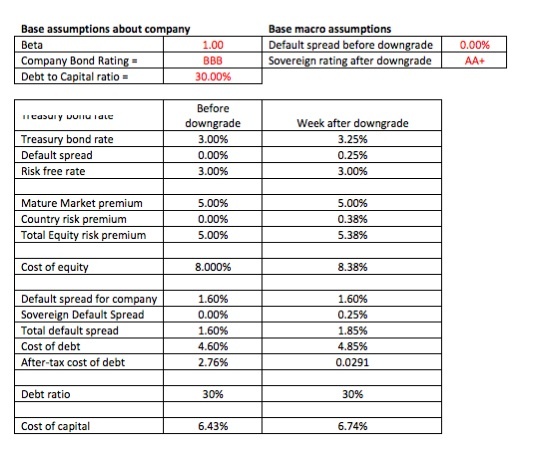 An explicit ratings downgrade will still have an effect on bond prices/rates but it will not be a surprise when it does happen. So, let's assume that the worst comes to pass. Deadlock persists in the DC or is resolved in an unsatisfactory plan. Standard & Poors and/or Moody's downgrades the United States from AAA to AA. Then what? If the treasury bond rate already includes a default spread, the day of the downgrade will be ugly for the bond market, with high volatility and big losses for impulsive traders, but I would not be surprised to see treasury bond rates return to pre-downgrade levels within a few weeks. If the ratings change is truly a complete surprise, then the treasury bond market will reflect substantial losses to bondholders on the day of the ratings change. Bottom line: My expectation is that the treasury bond rate will rise on the downgrade day but not by as much as experts seem to think. A few months ago I posted on a paper that I wrote last year titled "What if nothing is risk free? ", a question that no longer sounds hypothetical, but I examine practical ways in which risk free rates can be estimated when sovereign issuers have default risk. Bottom line: The US treasury bond rate will no longer be the risk free rate in US dollars. c. Equity Risk Premium: I have always argued that the equity risk premium will increase as country risk increases. Using the US equity risk premium as my base for a mature equity market, I have augmented it by adding a country risk premium, which is a function of the country default spread, obtained from either the rating or the CDS market. A downgrade of the US will cause two changes: a rethinking of what comprises a mature market premium and the adding of a country risk premium for the US. The net effect will be a higher equity risk premium for the US. In fact, using the default spread of 0.25% as the basis, the equity risk premium for the US will rise about 0.38%. One measure that will capture the effects of increased country risk is the implied equity risk premium that I compute for the S&P 500 at the start of every month. That number has risen over the course of this year from 5.20% at the start of the year to 5.72% at the start of July. I will do my August update in a few days and it will be interesting to see how this number shifts over the rest of the year. d. Costs of equity/capital for US firms: Even if risk free rates don't rise significantly, the costs of equity and capital for US firms will increase because of rising equity risk premiums (for cost of equity) and the increase in the cost of debt for all firms (which will now bear some of the burden of sovereign default risk). One simple way to adjust the cost of debt is to add the sovereign default spread to the cost of debt for all firms; thus, with a 0.25% default spread for the US, the pre-tax cost of debt for a US company will rise by 0.25%. The cost of capital increases by 0.31%, which may not seem like much but will have a substantial effect on value. Given my reasoning earlier, though, I don't think that the increase will be this high, since some or much of the change has already been priced in. You may disagree with the base assumptions and you can change them for yourself in the spreadsheet that I used. Note also that the effect will vary across companies and be much higher for riskier firms, with higher betas and lower bond ratings. Be prepared for some anomalies. It is possible that a few US corporations may have smaller default spreads than the US government. Let's face it. If you were a bondholder buying bonds, you may feel a lot more secure buying bonds issued by Exxon Mobil than by the US government. d. Valuation and stock prices: Holding all else constant, higher costs of equity/capital will lower stock prices. An increase of 0.31% in the cost of capital, estimated in the section above, would decrease the value of a mature firm by approximately 5%. (The spreadsheet makes this estimate as well...) What could accelerate this decline, though, is the perception that the sovereign default risk will percolate into fiscal/monetary policy (i.e., the Federal Reserve will become more cautious about pumping in more money into the system and the government has to rein in spending/borrowing) leading to a further slowing down in economic growth and lower earnings. To the extent that the sovereign rating for the US is now in play (and could change), it will add to the volatility in stock prices. Summing up. To act as if all of this drama will unfold on the date of the downgrade is giving far too much power and weight to the ratings agencies. This process has been going on for months (if not longer) and it is unclear how much the stock and bond markets have already incorporated into prices. A ratings downgrade, if it does occur, will not be a surprise and it is not the cause of economic malaise but a symptom of unresolved economic problems: a government that spends far more than it takes in and has been doing so for a while, households that save too little and borrow too much and a loss of the competitive advantages that the US once enjoyed over the rest of the world. But here is the depressing follow up. Even if there is a debt-ceiling deal by August 2 and the ratings agencies don't downgrade the US, these underlying problems will remain and have to be dealt with, sooner rather than later. For much of the last century, as public equity markets have grown, the choice for owners of private businesses that had growth potential was a simple one. Stay private, with limited access to equity capital or go public? In making the decision, the owner weighed the pluses and minuses of a public offering. On the plus side, liquidity increases and you have access to far more capital, generally at a lower cost, since the investors buying your equity tend to be more diversified (and thus willing to overlook a portion of the risk in your company). On the minus side, you risk loss of control (if not right away, but at some point in time in the future; remember the cautionary tale of Steve Jobs and Steve Wozniak being forced out of Apple in the 1980s) and you also have far more stringent corporate governance rules (think Sarbanes-Oxley) and information disclosure requirements. The venture capital market eased the transition, by allowing small firms that were not ready to go public to raise equity from private investors, albeit at a higher cost than they would pay in public markets. Thus, a company with a market beta of 0.8 (to a diversified investor) can have a total beta of 2.4 (to a completely undiversified owner) and 1.6 (to a partially diversified venture capitalist). I have a data set that summarizes my estimates of market and total betas by sector for US companies that you can take a look at, if you are interested. In the last few years, there have been two developments that have muddied the waters and changed the dynamics of whether and when firms go public. The first is the development of a private share market, where shares of private business can be traded by their owners, granting private businesses many of the advantages that they would have as public companies without much of the information disclosure/monitoring requirements that come with being public. Facebook is perhaps the most prominent example of a private business that has access to as much capital as almost any public company through this market. The second is the insidious route adopted by some non-US (primarily Chinese) private businesses that have bought small publicly traded US companies and used these companies as shell vehicles to gain access to public equity. In both cases, equity owners of these businesses are badly served, since they own portions of private businesses without the right to access information or influence management (that they at least in theory have with public companies). In know that the obvious fix to both these problems is to regulate these options, either by extending public company scrutiny to firms in the private share market or by barring trading in the market. However, the people who buy equity in Facebook in the private share market or a Chinese shell company are doing so voluntarily. Presumably, they are pricing in their concerns (or lack thereof) into what they pay and deserve to get whatever upside (or downside) they get from their investments. I will not envy them their returns but I will certainly not shed any tears for their losses, either. So, Facebook equity investors, I hope you make money on your investments.. but with Mark Zuckerberg as your lead partner, you should perhaps consult the Winkelvoss twins on how well your interests will be served. The talk of default is all around us, as we watch Greece and Italy struggle with impending disaster and the fight over debt limits in the United States fills the airwaves. But what is default? What are the consequences? And given a choice, when is default the best option? In effect, French banks are re-lending money to Greece at the rates that they set when Greece was viewed as a much healthier borrower. That is the equivalent of lending at below market rates and no amount of dancing around the truth will change that basic fact. What about borrowers? Is implicit default better than explicit default for them? While there may be more shame and immediate cost associated with the latter, it is sometimes better to default, accept failure and move on to making the fundamental changes that need to be made. With implicit default, both borrowers and lenders remain locked into a dance, where fundamental changes are delayed or deferred. It remains an open question whether Greece is better off with its austerity package (and implicit default) or whether it would have better served by defaulting on its debt (even though that may mean exiting the European Union and giving up on the Euro). I know that there are many economists and investors who view the latter as a doomsday option, noting that default by Greece would have led to default by Spain, Italy, Ireland an Portugal. Well, guess what? Greece managed to avoid explicit default but that did not stop Italy from moving into the danger zone this week. Greece's actions may have bought some time for the EU to fix its problem states, but unless the fundamentals change, it has not changed the underlying dynamics that created these problems in the first place.